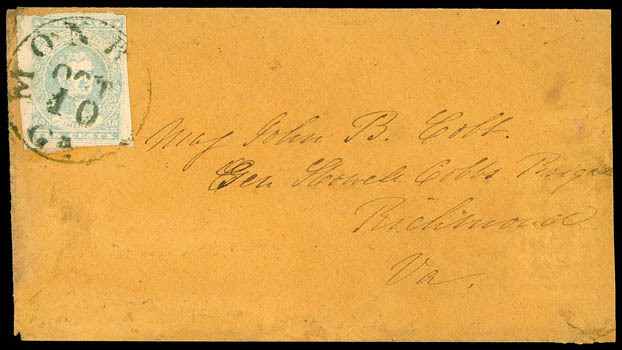 Confederacy, 1861, 10¢ light milky blue, Stone Y, large to huge margins including sheet margin at top, tied by bold strike of blue "Lynchburg Va, Apr 26" cds on brown homemade cover to Cumberland, Extremely Fine and choice. Scott No. 2e Estimate $400 - 600. 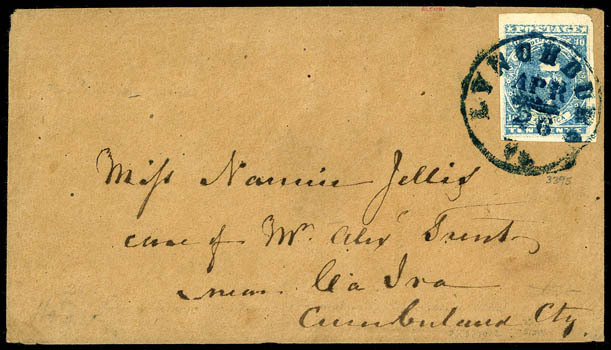 A BEAUTIFUL 10¢ STONE Y USE FROM LYNCHBURG VA.
Confederacy, 1861, 10¢ light milky blue, Stone Y, full to huge margins, tied by blue "Columbia S.C. Dec 10" cds on brown homemade turned cover to Charleston S.C., inside use bearing 5¢ light blue (6) pair, four margins, tied by sharp "Georgetown S.C. Nov 14, 1862" cds to Columbia S.C.; 10¢ with minor surface abrasion in margin, Very Fine turned usage, Pictured in Monroe Book, page 14., ex-Cantey; signed Kimbrough. 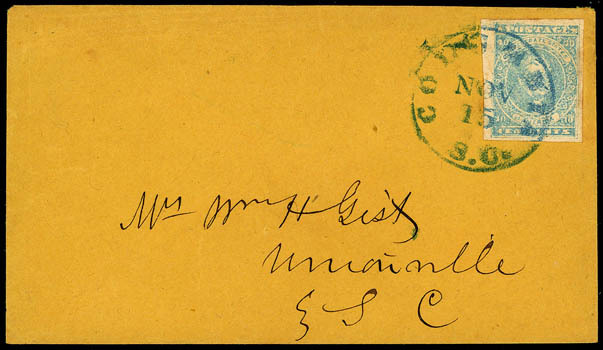 Confederacy, 1861, 10¢ light milky blue, Stone Y, large to huge margins, tied by "Columbia S.C., Nov 15" cds on orange cover to Unionville S.C., Very Fine and choice, ex-Judd. Scott No. 2e var. Estimate $300 - 400. 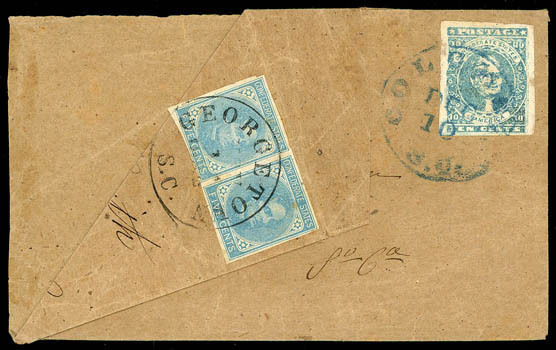 Confederacy, 1861, 10¢ light milky blue, Stone Y, three singles copies, mostly complete margins, some faults, tied by three strikes of "Charleston, S.C., Oct 14, 1862" cds to 1862 folded letter of administration to Hamburg S.C.; light overall toning, Fine and scarce triple-weight use. Scott No. 2e Estimate $300 - 400. Hamburg S.C. was a town located at the western terminus of the South Carolina railroad on the Savannah River. 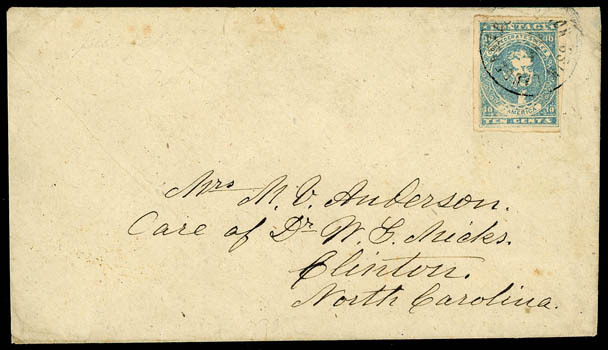 Confederacy, 1861, 10¢ light milky blue, Stone Y, four mostly large margins, tied by Lauderdale Station, Miss." cds on homemade cover to Clinton N.C., Very Fine. Scott No. 2e Estimate $200 - 300. Confederacy, 1861, 10¢ milky blue, Stone Y, light margins, light crease, tied by green "Monroe, Ga., Oct 10" cds on orange cover to Maj. John B. Cobb, Gen Howell Cobbs Brigade, Richmond Va.; small tear and right flap missing, otherwise Very Fine and rare green cancel, a beauty, ex-Weill Bros.; with 2000 C.S.A. certificate. 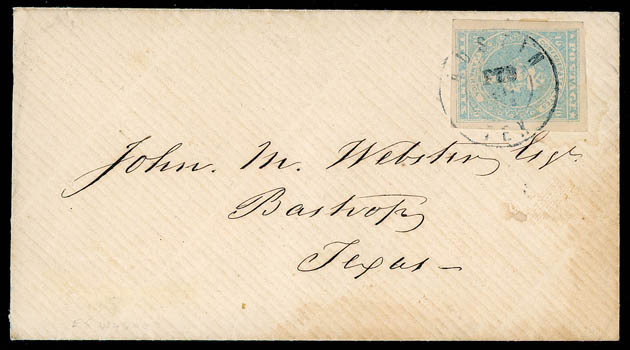 Confederacy, 1861, 10¢ blue, Stone Y, large margins, tied by "Austin Tex, Feb 24, 1862" cds on cover to Bastrop, Texas, Feb 25th receipt docketing on reverse, Very Fine and scarce Texas use. Scott No. 2; $525 Estimate $300 - 400. 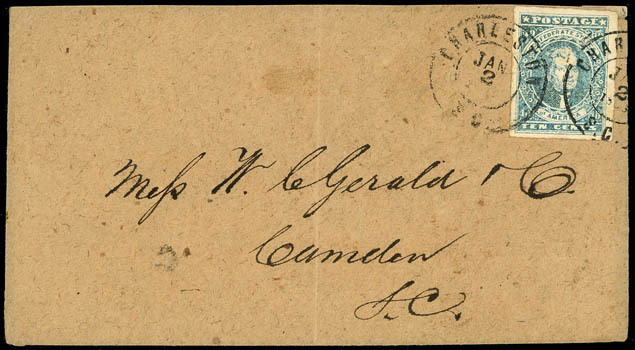 Confederacy, 1861, 10¢ greenish blue, Stone Y, four large margins, tied by two strikes of "Charleston S.C., Jan 2, 1863" cds on homemade brown cover to Camden S.C., Very Fine. 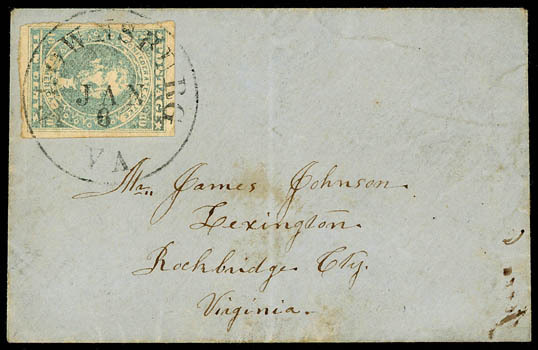 Confederacy, 1861, 10¢ light milky blue, ample to large margins, tied by "Brownsburg, Va., Jan 6" cds on small cover to Lexington, Va., Very Fine. 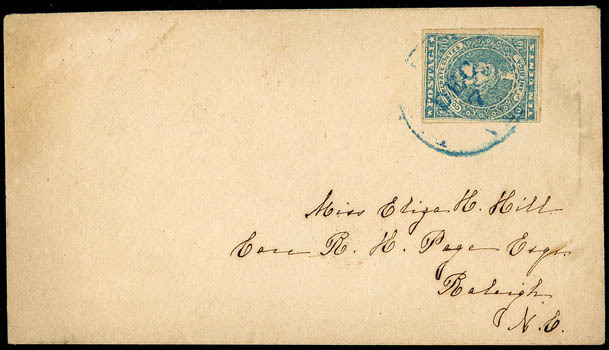 Confederacy, 1861, 10¢ light milky blue, margins ample to touching, tied by light strike of blue Petersburg, Va. cds on cover to Raleigh, N.C., Very Fine. Scott No. 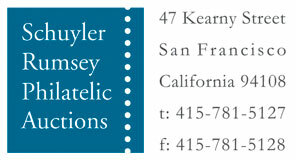 2e Estimate $150 - 200.